How to be both is the dazzling new novel by Ali Smith. Winner of the GoldSmiths Prize 2014 Shortlisted for the Man Booker Prize 2014 Winner of the 2014 Costa Novel Award Winner of the Saltire Society Literary Book of the Year Award 2014 Nominated for the Folio Prize 2015. 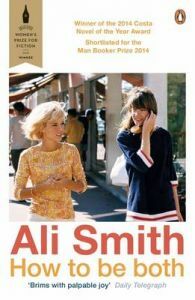 Passionate, compassionate, vitally inventive and scrupulously playful, Ali Smith's novels are like nothing else. How to be both is a novel all about art's versatility. Borrowing from painting's fresco technique to make an original literary double-take, it's a fast-moving genre-bending conversation between forms, times, truths and fictions. There's a renaissance artist of the 1460s. There's the child of a child of the 1960s. Two tales of love and injustice twist into a singular yarn where time gets timeless, structural gets playful, knowing gets mysterious, fictional gets real - and all life's givens get given a second chance. "Smith can make anything happen, which is why she is one of our most exciting writers today." (Daily Telegraph). "She's a genius, genuinely modern in the heroic, glorious sense." (Alain de Botton). "I take my hat off to Ali Smith. Her writing lifts the soul." (Evening Standard).